WASHINGTON — For U.S. presidents, meeting the families of military personnel killed in war is about as wrenching as the presidency gets. 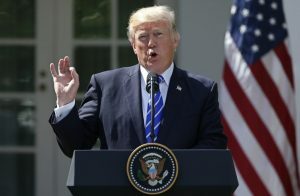 President Donald Trump’s suggestion Monday that his predecessors fell short in that duty brought a visceral reaction from those who witnessed those grieving encounters. “He’s a deranged animal,” Alyssa Mastromonaco, a former deputy chief of staff to President Barack Obama, tweeted about Trump. With an expletive, she called Trump’s statement in the Rose Garden a lie. Bush, even at the height of two wars, “wrote all the families of the fallen,” said Freddy Ford, spokesman for the ex-president. Ford said Bush also called or met “hundreds, if not thousands” of family members of the war dead. Obama’s official photographer, Pete Souza, tweeted that he photographed Obama “meeting with hundreds of wounded soldiers, and family members of those killed in action.” Others recalled his frequent visits with Gold Star families, and travels to Walter Reed, Dover and other venues with families of the dead and with the wounded. “I actually wrote letters individually to the soldiers we’re talking about, and they’re going to be going out either today or tomorrow,” he said, meaning he wrote to the families of the fallen soldiers. He did not explain why letters had not been sent yet, more than a week after the attack. “If you look at President Obama and other presidents, most of them didn’t make calls,” Trump said. Bush’s commitment to writing to all military families of the dead and to reaching out by phone or meeting with many others came despite the enormity of the task. In the Iraq war alone, U.S. combat deaths were highest during his presidency, exceeding 800 each year from 2004 through 2007. The number fell to 313 in Bush’s last year in office as the insurgency faded. Bush once said he felt the appropriate way to show his respect was to meet family members in private. Obama declared an end to combat operations in Iraq in August 2010 and the last U.S. troops were withdrawn in December 2011. As Obama wound down that war, he sent tens of thousands more troops into Afghanistan in 2009 and 2010, and the death count mounted. From a total of 155 Americans killed in Afghanistan in 2008, which was Bush’s last full year in office, the number jumped to 311 in 2009 and peaked the next year at 498. In all, more than 1,700 died in Afghanistan on Obama’s watch. Among other rituals honoring military families, the Obamas had a “Gold Star” Christmas tree in the White House decorated with hundreds of photos and notes from people who had lost loved ones in war. Gold Star families visited during the holidays, bringing ornaments. Trump visited Dover early in his presidency, going in February with his daughter Ivanka for the return of the remains of a U.S. Navy SEAL killed during a raid in Yemen, William “Ryan” Owens. Trump’s relations with Gold Star families have not always been smooth, dating from his belittlement of the parents of slain U.S. soldier Humayun Khan, who was Muslim. Trump was angered when the soldier’s father, Khizr Khan, was given a platform to criticize him at the Democratic National Convention. Owens’ grieving father said he didn’t want to talk with Trump at Dover. But the sailor’s widow, Carryn, attended Trump’s address to Congress and wept as he thanked her.